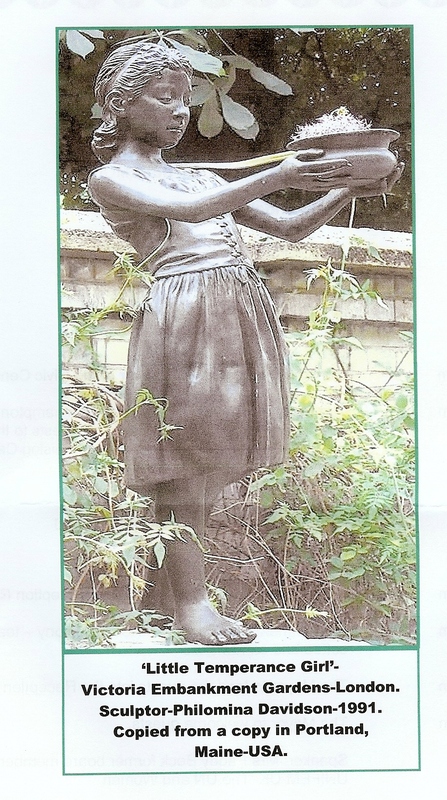 **Sculptures I Knew-‘Little Temperance Girl’ .(96). In memory of Lady Henry Somerset-Temperance Campaigner. The original sculpture -listed-Grade II- was by George Wade ( 1853-1953) in 1897. Sadly stolen in 1971. The fate of many metal features these days. More attention needs to be given to installation security methods? The original copyright & mould are held by Westminster City Council. 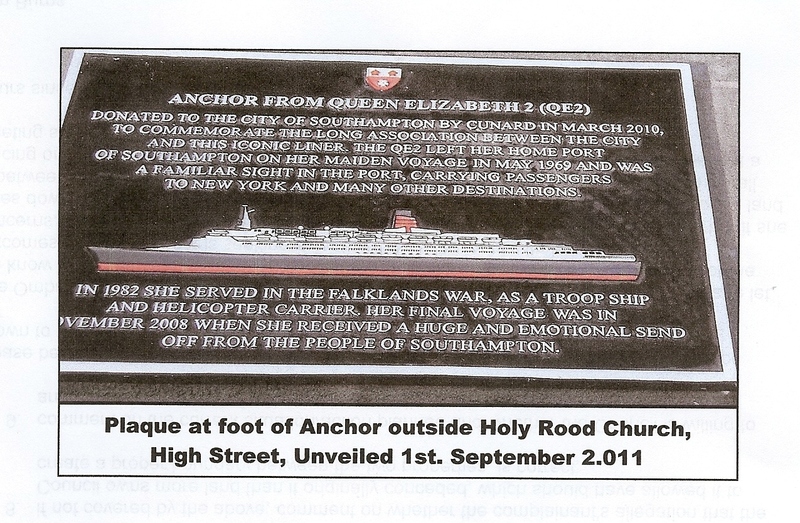 In 2002 an attempt to seek a copy for installation in Rockstone Place , to commemorate the gift to Southampton by the sisters, in 1879, was not given by Westminster City Council. Another copy was in the late Edward Heath’s garden at his house-‘Arundells’ in Salisbury. 'Glass panel' proposal superior to plinths without names-for all to see. 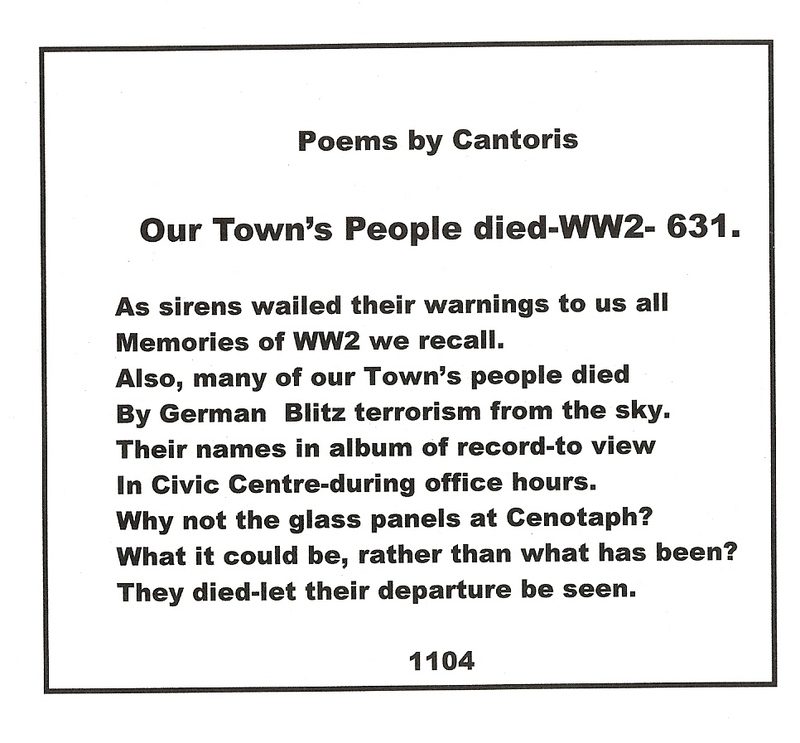 Cenotaph ‘Glass Panels’ -remember them for all to see. 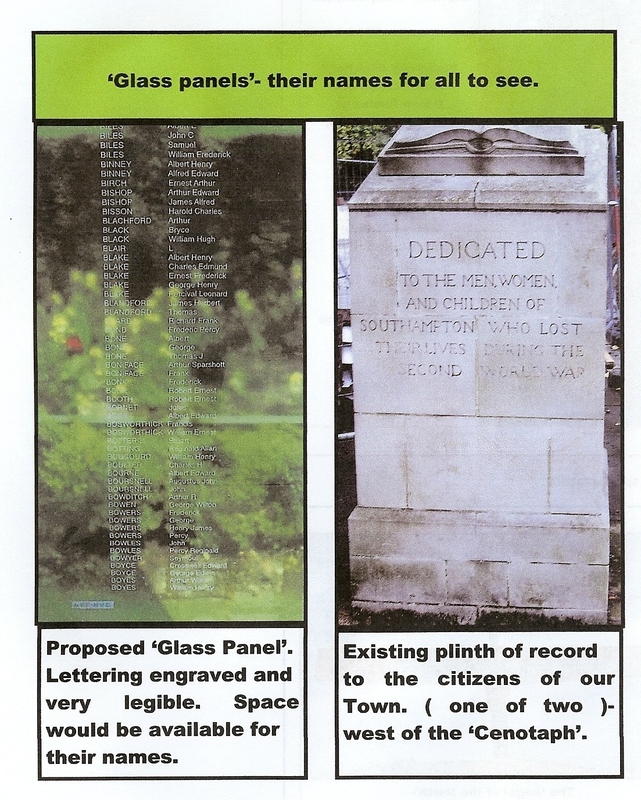 Tne names on the Cenotaph were mainly unreadable due to time & weather-hence the proposals now in place to install ‘Glass Panels’ at ground level. All names viewable by people at any time or day.The lettering on the two plinths is poor & no names are present-hence the proposal for a similar ‘Glass Panel’ system at ground level. Consultation with the public should be carried out to seek their views. Of interest the USA’s approach for ‘Ground Zero’ is a good example. (Plinth – 13/9/2011 ). View east to Holy Rood Church-Merchant Navy Memorial. At the foot of the Anchor. Seats for people to enjoy the settng. 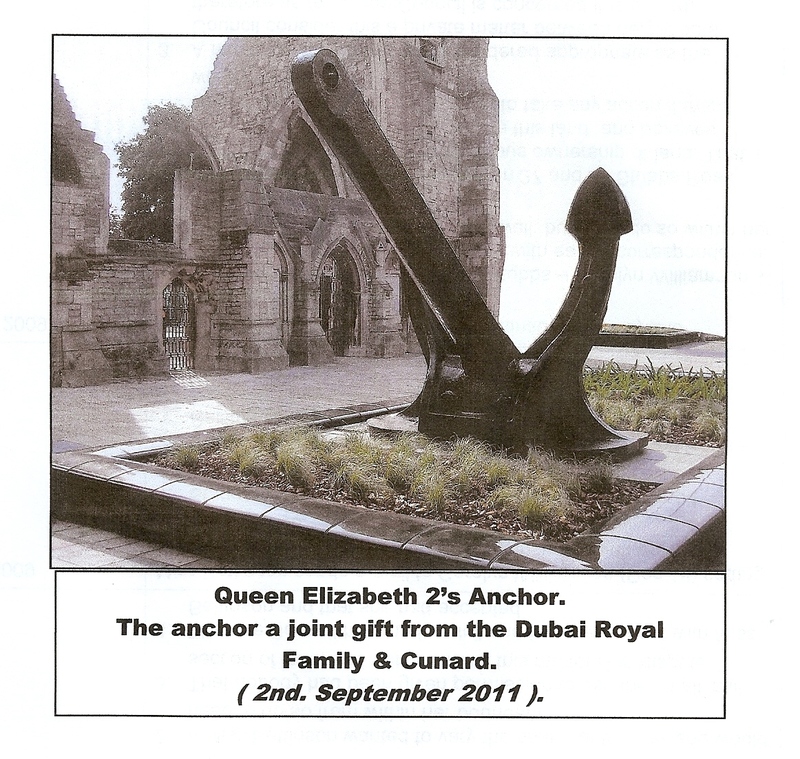 The Anchor donated jointly by the Dubai Royal Family & Cunard. The area outside the Holy Rood Church-( destroyed in WW2 by German Bombing ) has been upgraded & will form part of the ‘QE 2 Mile’ pedestrian route from the Cenotaph to the Town Quay. NB. 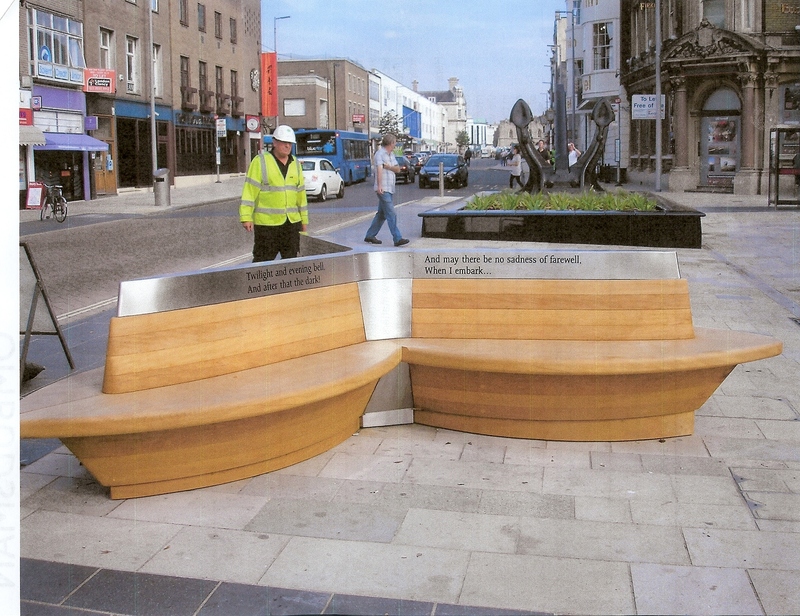 Care concerns- hopefully the fixings will be thief- proof ( the Plaque to Clr Michael Andrews opposite -stolen ), & the polished , curved surrounds to the Features, will prevent damage by ‘skate boarders’ ( already to the seats in ‘Guildhall Square’). The fine seats, above, have already attracted ‘graffiti abuse’. Hopefully, better care will be applied to this feature than to the ‘Jonas Nichols’ Fountain (listed grade 2) in St. Marys? ( See Blog No.26 ).